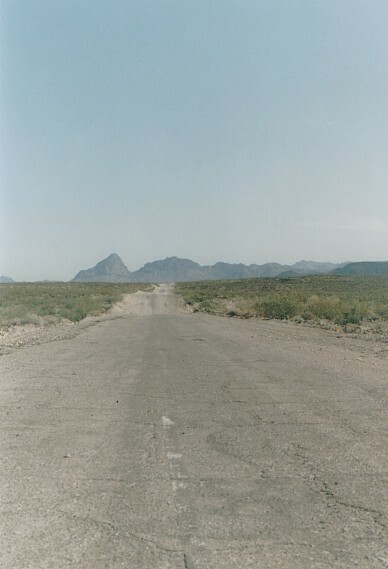 The location for this scene is from along the original Route 66 in Western Arizona, bypassed by a more modern route many decades before the coming of the replacing Interstate. There is an indistinct white center line. It has been dozens of years since the color white has been used to separate traffic directions, and thus this marking is a fading artifact. The desert air has likely helped preserve it, so far. The distant mountains seem almost a mirage; and the empty road and the stark surroundings are shimmering with "something."